The underpinning evidence base for the model is now described in terms of the data types. 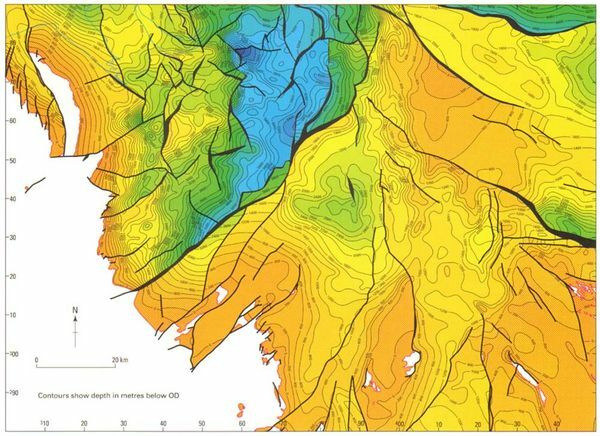 The Digital Terrain Model (DTM) was initially prepared in 2009–10 from the licensed national NextMap 5 m coverage, and sub-sampled with a variable grid spacing of 250 m along buffered section alignments and 2500 m in intervening areas. This was then replaced in 2011 with an overall NextMap coverage sub-sampled to 500 m due to the increase in the number of sections. This dataset also includes for the Isle of Man and Northern Ireland SRTM (Shuttle Radar Topography Mission data) data at 75 m resolution for the former and 30 m resolution for the latter, subsampled to 250 m. The SRTM data are distributed by the Land Processes Distributed Active Archive Center (LP DAAC), located at USGS/EROS, Sioux Falls, SD. http://lpdaac.usgs.gov. The DTM was updated for the current version to include the DigBath 250 bathymetry dataset (http://www.bgs.ac.uk/products/digbath250/home.html), which was used to extend the coverage to a minimum of 25 km offshore, subsampled to 500 m.
Throughout the various stages of construction the model has been built to be broadly compatible with the geological linework of the BGS 1:625 000 scale bedrock mapsheets, UK North and South (BGS 2007a; 2007b; Figure 4). Higher resolution map data has been considered where greater stratigraphical or structural detail was required. For offshore areas, the nearest equivalent dataset is the bedrock theme of DigRock250 http://www.bgs.ac.uk/products/offshore/ DigRock250.html a 1:250 000-scale digital map dataset. All of these map data are held by BGS as ESRI shape files. Some of the detail on these map sheets of faulting, minor intrusions and lithological variations within units was not included in the cross-sections. The same stratigraphical schema was however followed and some 341 units including intrusions and metamorphic suites were distinguished in the GB3D_v2012 version. The extension to the nearshore and particularly the current development of the model in Northern Ireland has increased the number of units to 445 in the UK3D_v2015 model. The geology portrayed on these mapsheets is described in two accompanying booklets (Jackson, 2008; Stone, 2008). 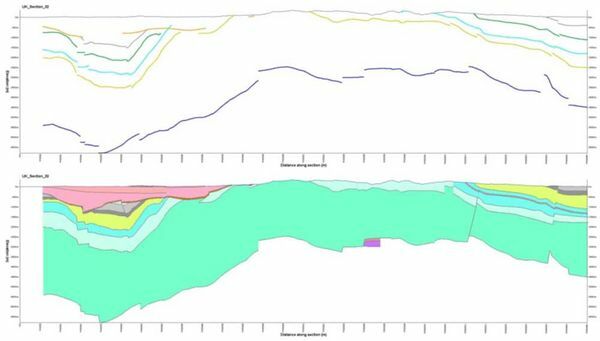 Within the cross-sections the two principal groundwater aquifers of England and Wales, the Chalk Group and the Sherwood Sandstone Group, contain additional stratigraphic detail mainly to formation level, where resolvable, at the request of the Environment Agency. Figure 4 Printed version of the BGS 1:625 000 scale bedrock geological data combined from the two component mapsheets. The structure contour plots (e.g. Figure 5) that were utilised to inform the cross-section construction are mainly derived from the BGS Subsurface Memoir and 1:50 000 scale Sheet Memoir series together with the published scientific literature. They in turn comprise syntheses of available deep borehole logs and interpreted seismic data for key stratigraphic surfaces and unconformities. These sources are listed in the ‘section tracker database’ (described in Metadata) together with a record of the individual sections that utilised each of these sources. No equivalent of the regional structural contours derived from subsurface memoirs was available for the Northern Ireland extension of the model. Figure 5 Depth to Caledonian unconformity for the south-west Pennine Basin and adjacent area (from Smith, et al. 2005). Contours are in 200 m intervals and are offset by geological faults, shown as black lines where they intersect the unconformity. The existing BGS 1:50 000 scale mapsheet series contains cross-sections that are held as scale-true 3D shapefiles. These were imported into the model workspace as short intersecting segments to guide construction of the UK3D cross-sections (currently these cross-sections are crossed by UK3D sections at 469 locations). In the GSI3D software section drawing window they were displayed as colour-coded cross ticks or arrows (Figure 6). Data from about 130 individual 1:50 000 scale cross-sections were utilised, although none were used in Northern Ireland extension. 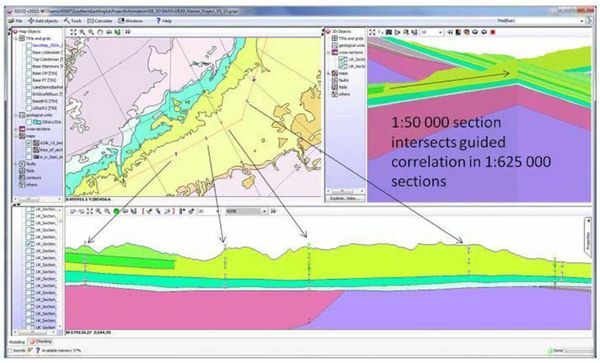 Figure 6 Section shown in green in the map view (upper left) and under construction in section view (below) showing cross ticks from 1:50 000 section intersections as guides (below). Notice the higher resolution stratigraphy available from in the 1:50 000 section in the 3D view (upper right). NEXTMap Britain elevation data from Intermap Technologies. Existing 3D Geological Framework Models were used in UK3D_v2015 cross-section construction to guide the geologists’ interpretations. Figure 7 shows the distribution of BGS models, including many that were considered in the development of UK3D_v2015. The 3D model data is sliced along the lines of the UK3D_v2015 cross-sections and is displayed as a series of colour-coded traces in a raster back-drop in the GSI3D section construction window (Figure 8) so that the geologist could use it as a guide. In some areas poor model calculation is evident, particularly near to the ground surface where published map data has greater veracity, and in such cases the geologist chose to override the model information (Figure 8). Slices through BGS 1:250 000 scale resolution GOCAD models based on the BGS subsurface memoir series of sedimentary basins in Northumberland-Solway, East Midlands, Southwest Pennines, Craven and Weald contributed much useful detail. In addition more detailed 1:50 000 scale resolution GSI3D models, mainly located in the London Basin and southern East Anglia-Essex were also utilised (Figure 7). These 1:50 000 scale GSI3D models are in the main shallow and so they only contribute information on the uppermost bedrock units. Details of the data utilised in the construction of these various models are contained in the separate reports and metadata documentation for the individual models. Where multiple resolution models were available the highest resolution model was usually preferred to guide the interpretation unless this was known to be less reliable. In the section tracker database (see Model rules, use, limitations and uncertainty) the models utilised in the construction of the individual UK3D_v2015 cross-section are systematically recorded. In Northern Ireland, a crustal-scale model of the north of Ireland (Leslie et al. 2013), built as part of the Tellus Project (GSNI 2013), was used initially to guide construction of the UK3D_v2015sections. The low resolution of this model however prohibited use of any depth picks in the new sections produced for this project. 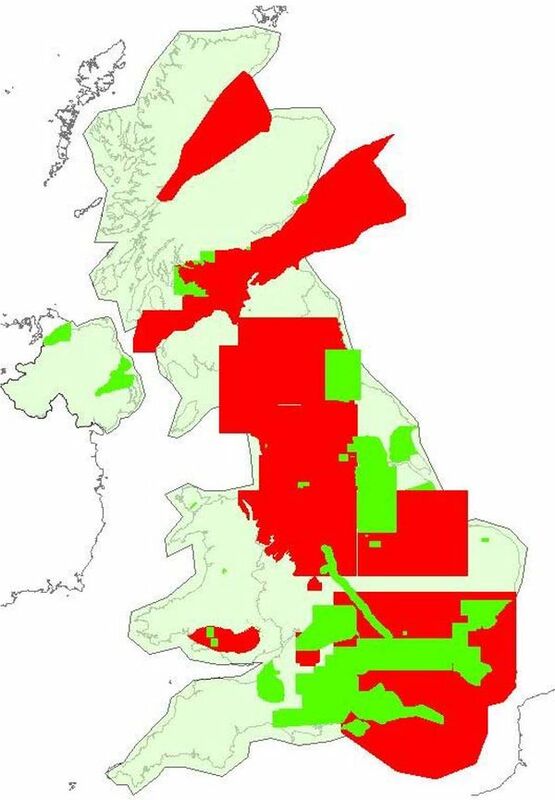 Figure 7 BGS 3D geological framework models at 2016, red shows regional and basin-scale models whereas the green areas contain more detailed shallower models, some of which include Quaternary models that were not incorporated in UK3D_v2015. Green areas enclosed within larger red polygons usually contain models of both types. 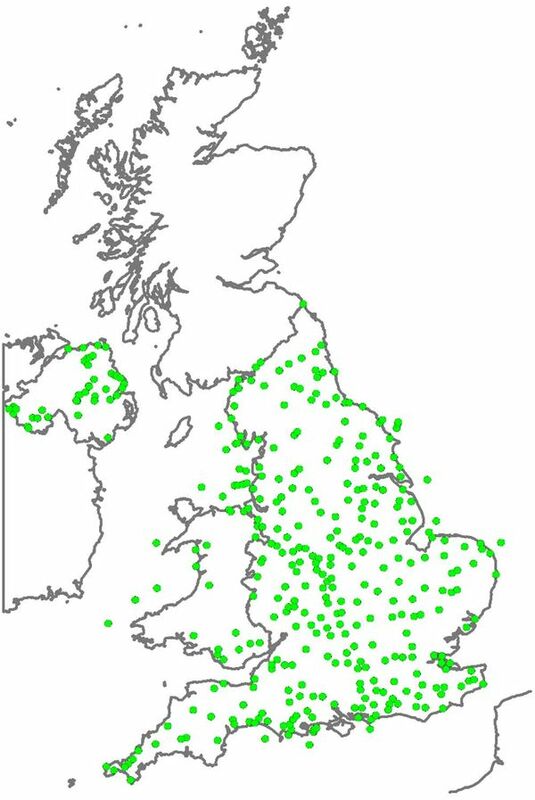 The 1:625 000 scale resolution model with national coverage (pale green) is UK3D_v2015. Figure 8 Attributed surfaces based on the Northumberland-Solway study (Chadwick et al. 1995) displayed along the line of an UK3D_v2015 section (above), the constructed section is shown below. Note that faults are shown as offsets in the stratigraphic surfaces. The colour schema for units in the two panels is not unified. NEXTMap Britain elevation data from Intermap Technologies. An important aim of recent phases of construction of GB3D_v2014 and UK3D_v2015 was the incorporation of 372 deep boreholes to produce an enhanced model for England, Wales and Northern Ireland. This provides demonstrable ‘tie-in’ of the UK3D sections to key data points provided by the boreholes and hence enforces model confidence. BGS holds records of several thousand deep (>250 m in length) boreholes so it was necessary to select a representative subset of these to incorporate into the model. A selection of non-confidential publicly available boreholes was chosen based on the need to achieve a good distribution of boreholes, utilize the deepest boreholes available, and include boreholes showing well-developed rock sequences. Boreholes with published interpretations were given preference. The final BGS borehole selection was used to guide section alignments. The distribution of boreholes (Figures 9, 10) nevertheless remains uneven due to the variable data availability. This in turn reflects the regional geology and the presence or absence of economic drivers for the drilling of deep boreholes. So, for example, there are very few deep boreholes in Mid Wales, the Lake District and north Essex where all the available data were used. In contrast, several areas contain a wealth of deep borehole data such as Central and Eastern England making the selection of representative boreholes more difficult. In Northern Ireland most of the deep boreholes are present in Co. Antrim, around Lough Neagh and in Co. Fermanagh, with very few deep boreholes present elsewhere. The selected boreholes were classified using the stratigraphic schema of the 1:625 000 scale mapsheets, in many cases existing BGS interpretations were simply accepted and copied across from the internal BGS Stratigraphic Surfaces and Borehole Geology databases. In other cases the boreholes were re-evaluated and a new interpretation was established. 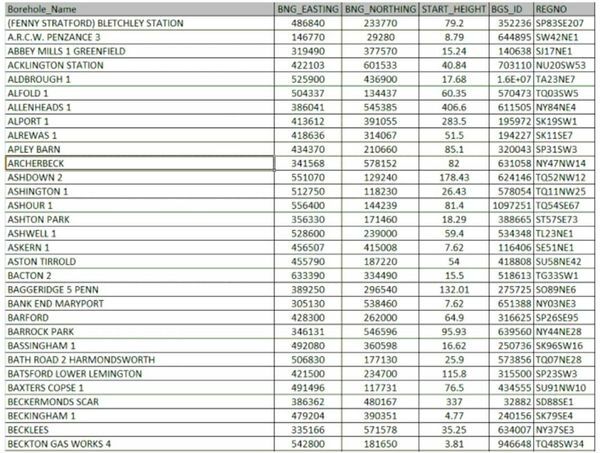 A comprehensive MsExcel spreadsheet of the boreholes was produced, giving their BGS Single Onshore Borehole Index (SOBI) name and number, their grid references and start height (Figure 11). This table comprises the GSI3D borehole index *.bid file. 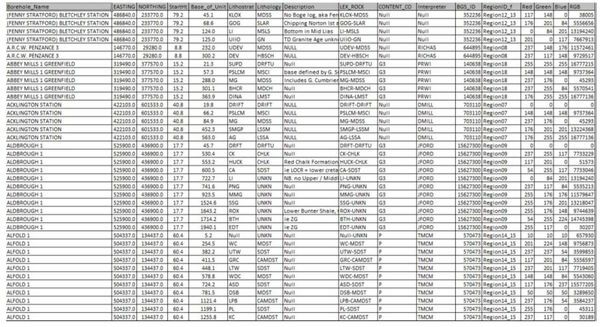 The downhole log spreadsheet identifies the units present identified by the BGS Lexicon codes and lithologies following the BGS Rock Classification Scheme, each contains the depth from the start height to the base of the unit. This comprises the GSI3D borehole log *.blg file shown in Figure 12. 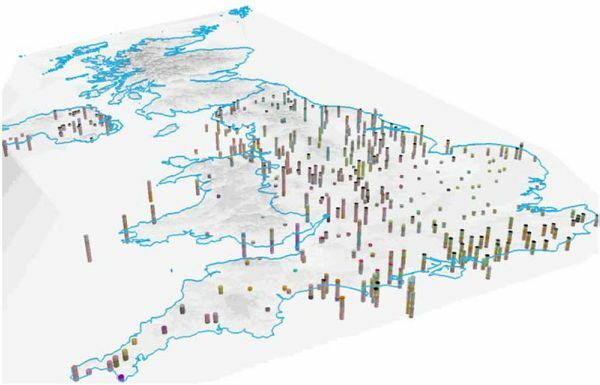 Figure 9 Locations of the 372 boreholes used in the UK3D_v2015 dataset. Figure 10 The classified borehole sticks showing stratigraphic interpretations. DTM source is described in section 3.1. Figure 11 Extract from the Master MsExcel spreadsheet of the boreholes (*.bid) listing, from left to right, their name, start position in x and y, in British National Grid, elevation (z) in m relative to O.D., their unique BGS record id, and their BGS borehole registration number (SOBI database). Figure 12 Extract from the downhole interpretation file (*blg) showing multiple entries for each borehole, key columns include no. 5 giving depth from the borehole start height in metres to the base of a unit, columns nos. 6 and 7 giving the BGS Lexicon and lithology codes, and column no.11 giving the initials of the interpreter. Seismic data have not been used directly in the construction of the fence diagram however this source has been extensively utilised in the production of the various BGS 250K resolution GOCAD models based on the BGS subsurface memoirs (Figure 7). Where multiple resolution models were available the highest resolution model was used to guide the interpretation unless it was known to be less reliable. In Northern Ireland, recently acquired, regional scale, high resolution, Tellus geophysical data sets (GSNI 2013) were used to improve the geological accuracy of the sections. The data proved particularly useful in the location of poorly exposed faults and to delimit the extent of concealed Palaeogene sills. In addition, regional gravity (Reay 2004) was used to constrain significant thickness variations associated with buried Permo-Triassic basins. ↑ British Geological Survey. 2007a. 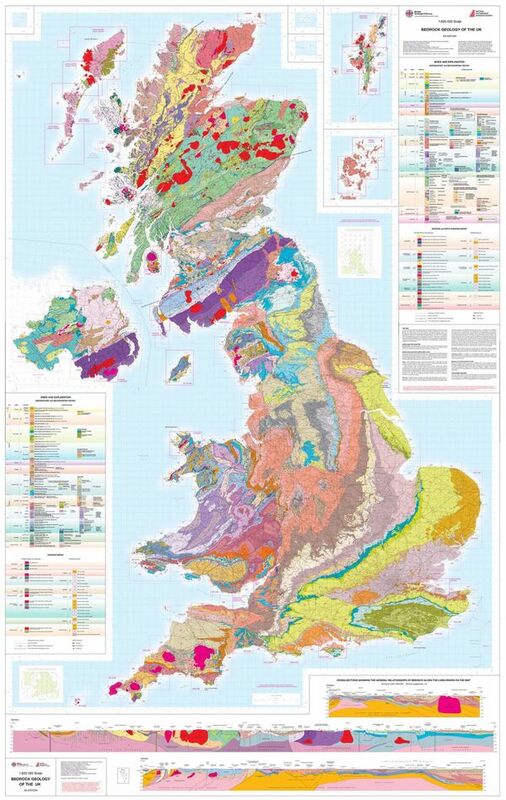 Bedrock Geology UK South 1:625 000 scale mapsheet 5th Edition. ↑ British Geological Survey. 2007b. Bedrock Geology UK North 1:625,000scale mapsheet 5th Edition. ↑ Leslie, G, Cooper, M R, and McConnell, B. 2013. Solid Achievement. Geoscientist, Feature Article, April, 10–15. ↑ 6.0 6.1 Geological Survey of Northern Ireland 2013. A guide to the Tellus data. Young, M E and Donald, A W. (eds). Geological Survey of Northern Ireland, Belfast. ↑ Chadwick, R A, Holliday, D W, Holloway, S, and Hulbert, A G. 1995. The structure and evolution of the Northumberland–Solway Basin and adjacent areas. Subsurface Memoir of the British Geological Survey. (London: HMSO). ↑ Reay, D M. 2004. Geophysics and Concealed Geology. In: The Geology of Northern Ireland — Our Natural Foundation. Mitchell, W I. (ed). Geological Survey of Northern Ireland, Belfast. This page was last modified on 8 March 2016, at 15:56.